It's the 1980s. 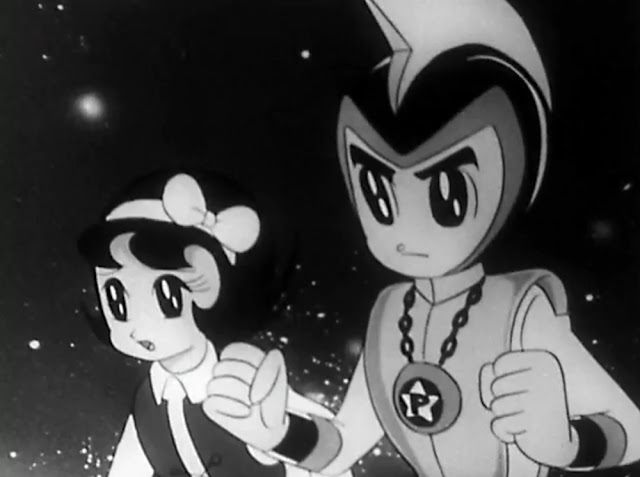 You're bored in front of the TV, punching buttons on that weird multiplex cable TV channel box with all the buttons and three levers, and you come across a Japanese cartoon that you've never seen, and it's about two kids, and a robot, and Jesus. Yeah, THAT Jesus. And you ask youself, how did I get here? The liberating influence of the Reformation put religion in the hands of anybody who could shout the Gospel and stir up a crowd, taking salvation out of the hands of a centralized bureaucracy and allowing a million tent revivals to bloom. Heir to the traditions of mass-media evangelists like Billy Sunday, Father Joe Coughlin, and Aimee Semple McPherson, Southern Baptist minister Pat Robertson founded the Christian Broadcasting Network in 1960 with the purchase of a small UHF station in Portsmouth Virginia. CBN's early days were financed via a telethon requesting 700 volunteers each giving $10, this "700 Club" becoming the genesis of Robertson's flagship current events/prayer series. Amidst the growth of cable television in the late 1970s, Robertson bought a cable TV channel in the area and soon CBN was a basic-cable fixture on TV sets, reaching 10 million homes by 1981. In the late 70s, CBN hired ad agency giant Young & Rubicam to promote sales of Christian literature in Japan. This is Japan in the late 1970s we're talking about here, in the midst of an unprecendented animation boom fueled by hits like Yamato, Gundam, Gatchaman, and others. Anyone with two eyes could see that animation was the way to go. 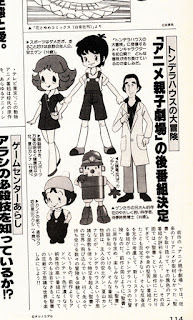 Hooking up with Japan's Yomiko Advertising Agency and perhaps emboldened by the prior ad agency/animation studio success of former SCDP exec Lou Avery's partnership with Tatsunoko to produce Scout's Honor, CBN would contract Tatsunoko to produce a Bible-themed cartoon for young people. 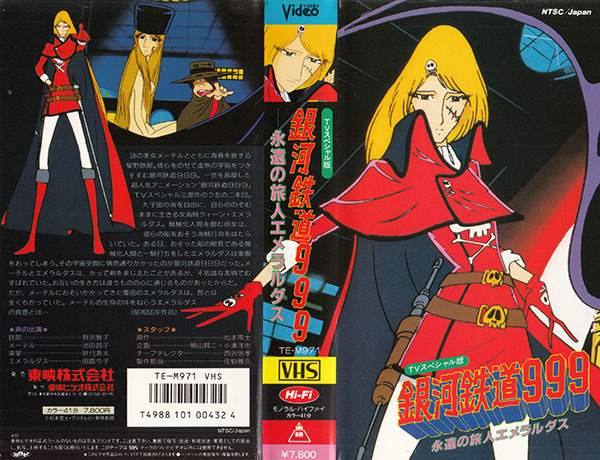 The resulting cartoon, Anime Oyako Gekijo, or "Anime Mother & Child Playhouse", would be directed by veteran Masakazu Higuchi (Vickie The Viking, Urikupen Rescue Team, The Real Ghostbusters) and would premiere Oct. 9, 1981 across the spectrum of Japanese broadcast television, on Fuji TV, TV Tokyo, Asahi TV, and TBS. The story stars young Chris Peeper (Sho Azuka), his friend Joy (Azusa Yamato) and toy robot Gizmo (Zenmaijikake) as they discover a mysterious old book in the attic of Chris' father, Professor Peeper. Opening up, the book transports them back in time to experience many of the stories of the Bible's Old Testament, with a few New Testament stories thrown in for good measure, but always returns them to the Peeper house at the end of the adventure in time for snacks. 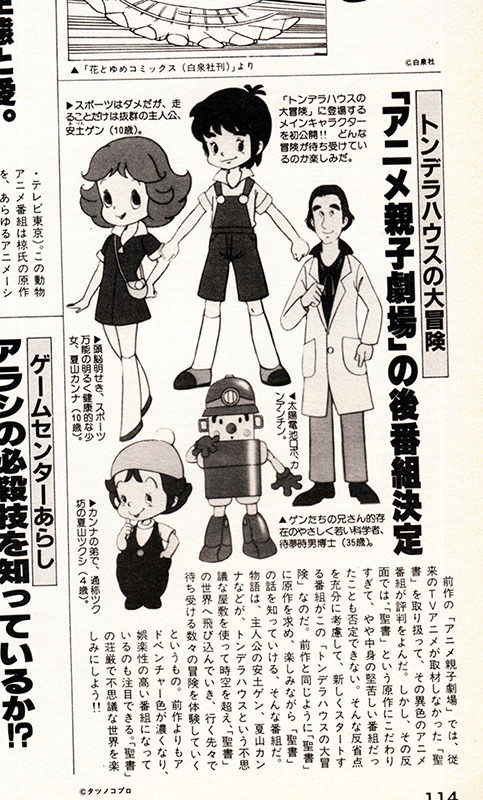 There's a very Tatsunoko look to the characters, particularly Professor Peeper, thanks to the work of veteran Muteking/Temple The Balloonist character designer Akiko Shimamoto. CBN was reportedly unsure about localizing the series for America, but let's get real, they did own a cable network and you always gotta have something to show on your cable network. The dub cast featured veterans of anime classics Astro Boy and Kimba The White Lion, including Billie Lou Watt, Ray "Aquaman" Owens as Jesus, Gilbert Mack, Peter Fernandez, Hal Studer, and others. Owens had been featured in CBN's Christian soap opera "Another Life", which is where he got wind of the upcoming cartoon-voice gig. 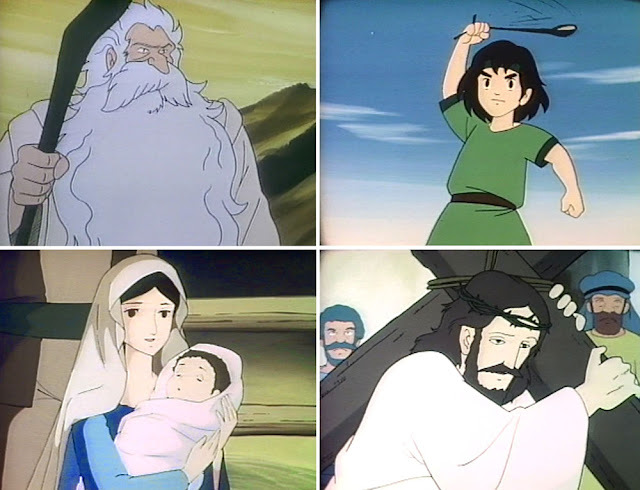 The series was given the title Superbook and in 1982 it premiered on CBN and became available to other broadcasters through CBN Continental Syndication. 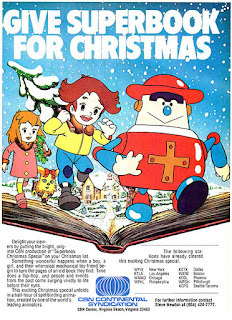 Superbook wasn't CBN's only big-eyed Japanese cartoon; other anime appearing on CBN included the Sonic International dubs of Honey Honey and Leo The Lion, and 3B Productions' compilation films of Voltes V, Fighting General Daimos (as "Starbirds") and Tatsunoko's 1979 "Daddy Longlegs" telefilm (directed by Superbook's Masakazu Higuchi). 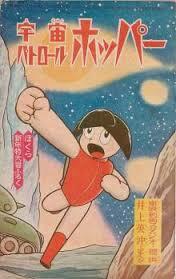 Anime Oyako Gekijo was followed immediately by "Adventure Of Tondera House", or as we'd know it, Flying House. While playing in the woods, youngsters Justin Casey (Gen Adachi) and his pal Angie (Kanna Natsuyama) and Angie's even-younger brother Corky (Tsukubo Natsuyama) are caught in a storm and seek shelter in a mysterious house where they meet an astonishing robot. This mysterious house and its robot inhabitant belong to Professor Bumble (Dr. Tokio Taimu – "time" – get it? ), who has created an amazing time machine built into the house itself, like those great intercom systems you see in mid-century suburban tract homes. A lightning strike reboots the robot S.I.R. into its combat mode and his flailing robot attacks send the house flying back through the ages to New Testament times. During an amazing series of 52 adventures our lost travellers witness the birth of Jesus and the early days of the Christian religion. Airing in Japan from April '82 until March of 1983, the series was also localized by the same cast and distributed by CBN. While both Flying House and Superbook use the same basic structure of "modern kids in Bible times", Flying House embedded those kids in the stories themselves, like AP stringers with the 3rd Infantry Division in Anbar Province. Justin, Angie and Corky visibly struggle alongside their new scriptural pals as the timeline asserts itself and the stories come to their King James-decreed conclusions. This distinguishes Flying House from Superbook, where characters having vague memories of these seemingly immortal kids is just a running gag, and any attempts by Chris or Joy at direct involvement unsupported by Leviticus, or Exodus, or whatever, see them yanked out of the past with an abrupt, unsettling counterclockwise sequence. The two shows feature very different kinds of involvement: enmeshment vs active observation. 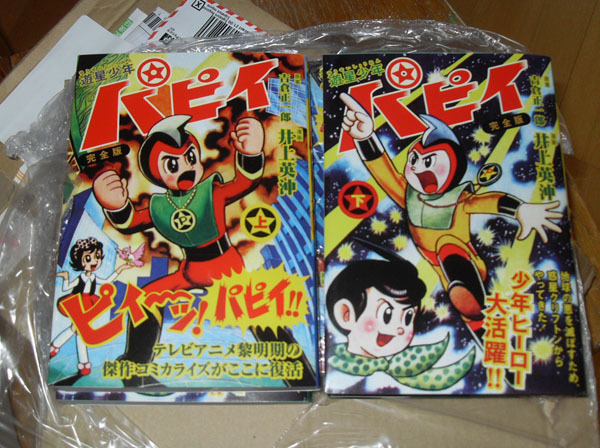 In the tumbling wake of the Flying House came the third part of Tatsunoko's Bible Trilogy. We know the further adventures of Chris, Joy, Gizmo as Superbook II, but in Japan the title is Pasocon Travel Tanteidan, or Personal Computer Travel Detectives, or PC Travel Detective Group, take your pick. As you may remember, the early 1980s were a boom time for personal computers both here and in Japan. When the Superbook and a PC team up, it means new Bible adventures for our Superbook kids, joined here by Chris's dog Ruffles and his cousin Uriah (in Japan, Sho's brother Yuu). Character designs are softened a little to reflect mid-80s aesthetics and the ravages of time, the show being set two years after the events of the first Superbook. 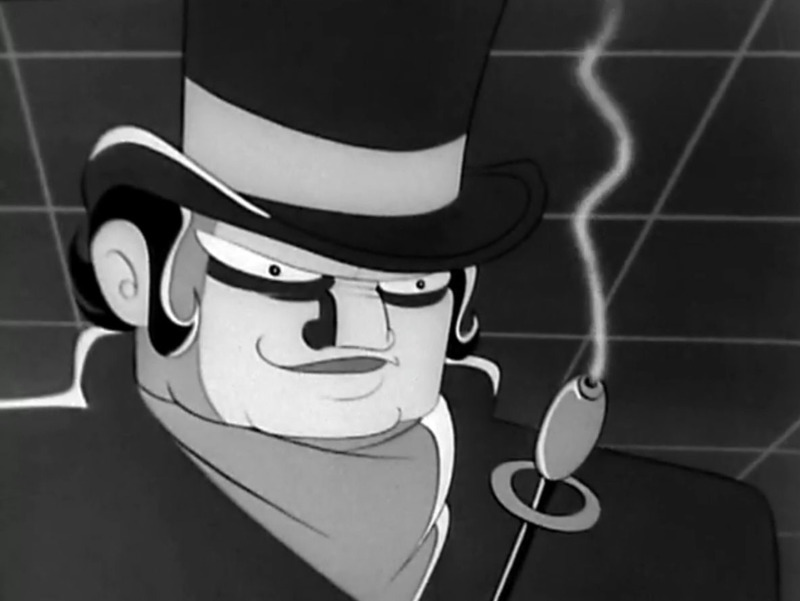 PC Travel Tanteidan aired 4-4-83 to 9-26-83, adding 26 episodes to the Superbook canon. Scriptural fidelity is probably too much to expect from a series that involves different sets of children travelling through time and witnessing different iterations of the same Biblical events, and each series handles interaction with religious events and characters differently, Superbook's kids being passive observers and Flying House's Justin and Angie doing their best to mess with history. 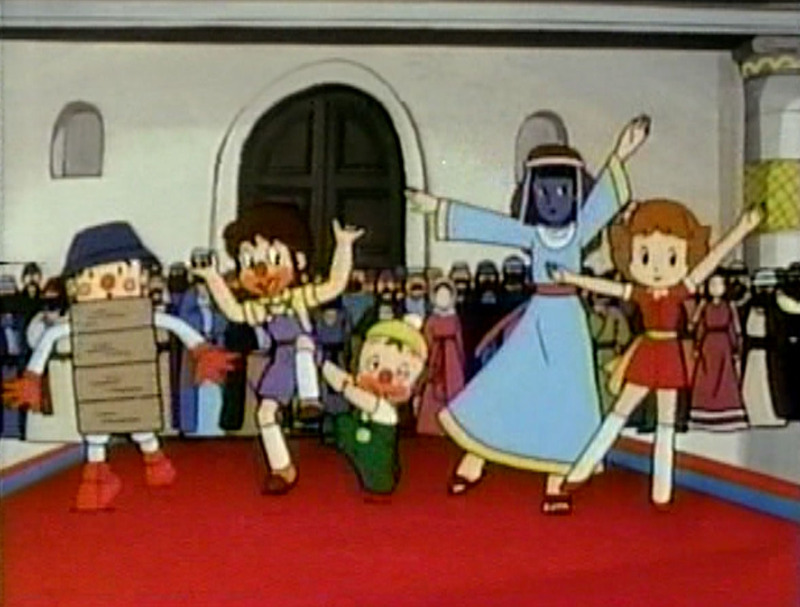 Both shows take dramatic liberty with the Gospels; for instance, Flying House has Justin, Angie and Corky being tempted by Satan alongside Jesus, and the show reinterprets the dance of Salome into a children's talent show and involves the kids in an ethical capital-punishment quandary with the son of Barabbas (the murderer set free instead of Jesus). Tatsunoko's utilitarian animation lacks both the tricky special effects we'd see in their more fantastical series and the props or gadgets typically inserted into shows for the toy market. Since Tatsunoko already had CBN financing, they didn't need Takatoku. The second series of Superbook improves slightly, but lacks visual excitement when compared to concurrent series like Orguss, Dunbine, Mospeada, and Vifam. Jesus and the Flying House kids are tempted by Satan via animation reference from "Little Norse Prince"
In 1985 CBN produced a Spanish language version of Superbook. Eventually the series would reach fifty nations, including a Soviet Union in the throes of Glasnost and Perestroika. Superbook on Soviet Central TV was immensely popular in the twilight days of the USSR and when party bigwigs threatened cancellation, the series sparked a revolt among the Children's Television Department. At one point the show was receiving 30,000 letters from viewers every day. In 1990 CBN rebranded as the Family Channel, which was sold and became Fox Family, which was sold and became ABC Family. Superbook and Flying House relocated to the Trinity Broadcasting Network, run by the televangelist Crouch couple. As streaming video became a thing CBN began streaming Flying House for free while keeping most of Superbook behind a paywall, and building an online interactive children's experience around a Superbook reboot. 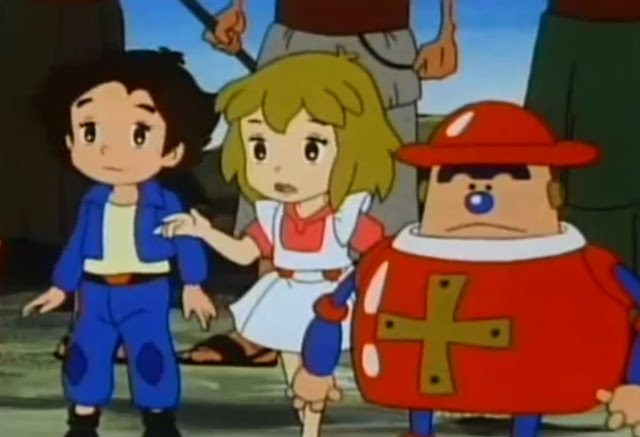 In spite of the interest in Japanese animation, most self-professed "otaku" would be hesitant to list Superbook as being an influential anime import. And yet, the worldwide reach of this franchise rivals or surpasses titles like Robotech, Sailor Moon or Star Blazers. Superbook/Flying House has been shown continuously for decades in dozens of languages, impacting millions and millions of viewers. Few TV shows of any sort can boast that kind of reach. Of course, Superbook has built-in educational and religious advantages attractive to parents desperate for wholesome family entertainment that their kids will actually sit still for. Prior to Superbook, seekers of scriptural kids TV had to rely on Davey & Goliath or Jot, or the occasional Moody Institute of Science short. Superbook/Flying House videos were available in retail and Christian specialty stores and advertised on TV, unheard of in the anime field at the time. Among its target audience of easily impressed children with limited access to TV remote controls, Superbook has remained surprisingly resilient. The series continues to entertain with the original series and with a new, computer-animated Superbook update currently in vogue among the Sunday School set around the world, starring an updated Gizmo and Chris Quantum, who is reportedly "an awesome skate-boarder." The new Superbook is featured on websites, DVD purchasing clubs, online games, and broadcast and streaming video, while the neglected Flying House has yet to receive any updates or reboots at all. 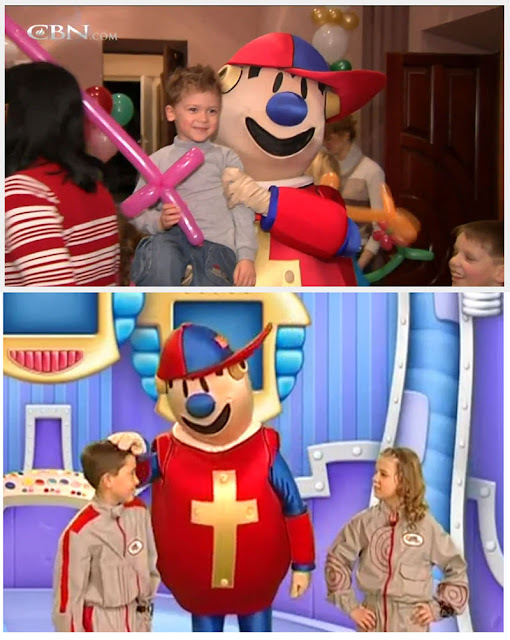 We may have Eastern Europe's love of Superbook to thank for the show's longevity; Ukraine's Emmaneuil TV started airing the children's show Superbook Club in 1996, based on a Superbook-themed youth group initiative. 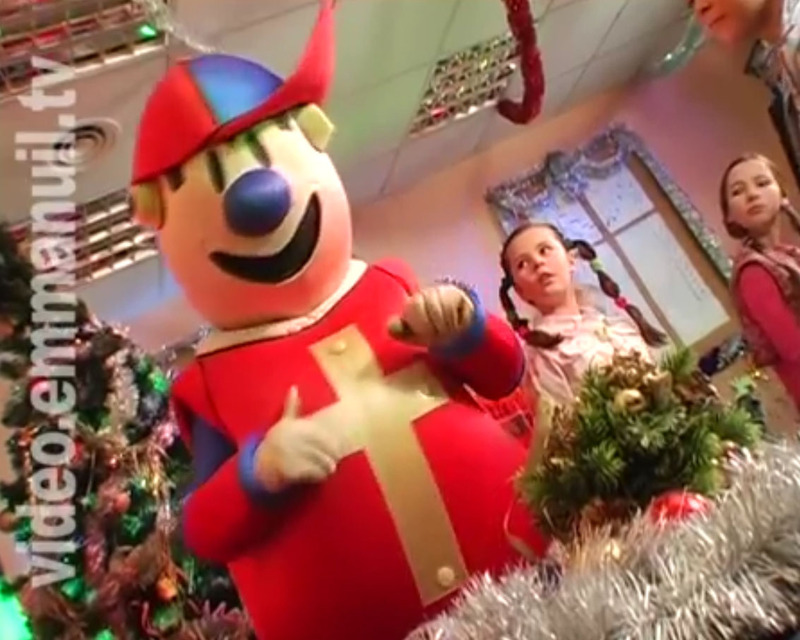 The live-action series stars lots of kids and a long-suffering suit actor in a Gizmo costume – over there he's known as Robik, and yes, he did upgrade to the new CG Superbook look - and kids 6-14 can write or email Robik with any question they may have, and can even call him on his toll-free Robik Hot Line. Meanwhile, the kids of the Superbook Club are ready 24/7 to sing, dance, and have low-key adventures across the CIS states of Europe and Western Asia. Sure, Superbook and Flying House are simplistic children's cartoons selling a watered-down Gospel ultimately for the benefit of multi-millionaire Gospel grifter Pat Robertson. 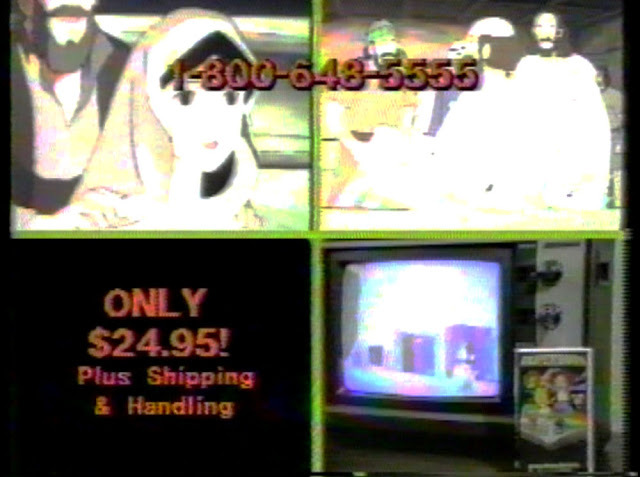 But nothing illustrates the global reach of Japanese animation like Virginian televangelists hiring Asian studios to animate the Middle Eastern cultural traditions that formed the religions of the Western world. Perhaps anime does indeed, as the song says, have the whole world in its hands. Special thanks to William J. Brown and Benson P. Fraser for their scholarly and informative "The Diffusion of Superbook: One of the World's Most Popular Entertainment-Education Television Series", and a big super Let's Anime thanks to fellow recreational Christianity researcher Wednesday White for her invaluable insight into the world of Superbook and Flying House! Happy Holidays from Superbook Club & Let's Anime! Fifty years ago a Japanese candy company, a Tokyo cartoon studio, an American production outfit, a future biker-movie star, and TV stations across America would join forces to bring us adventures that crossed the boundaries of time and space and bent both logic and common sense. Soon these stories would vanish from television, living on only as fuzzy memories and fuzzier bootleg VHS tapes, returning only with the advent of streaming video and digital broadcast television. 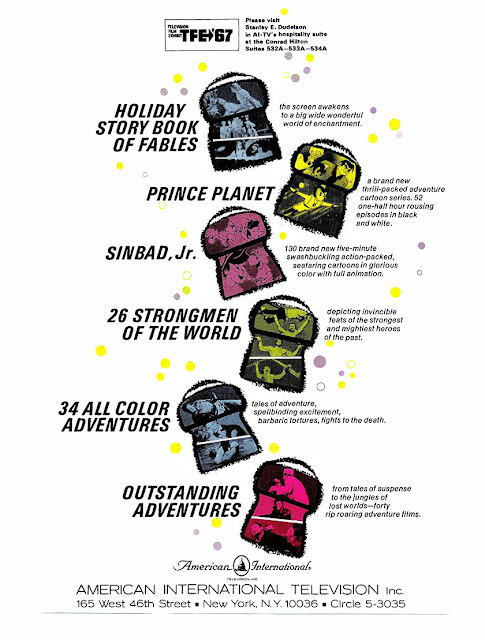 Join us, won't you, as we take a look at fifty years in the life of Prince Planet. 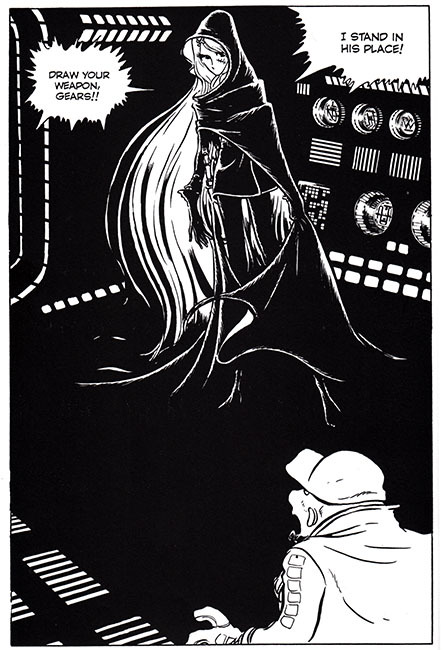 1939: future Yusei Shonen Papi manga artist Hideoki Inoue is born in Hokkaido. 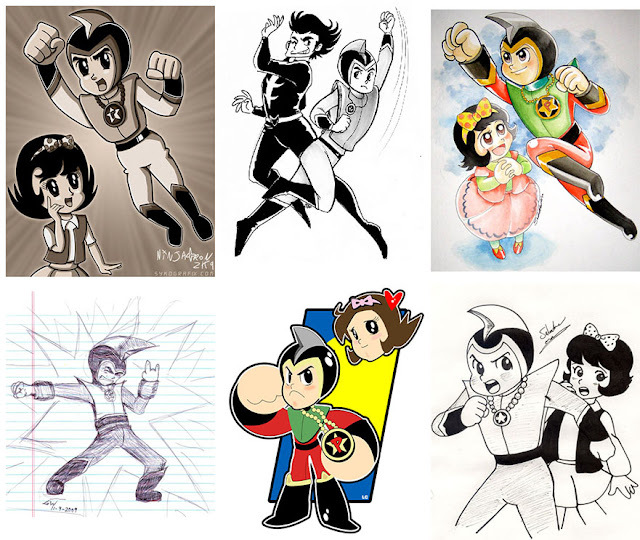 He will enter the manga field as an assistant to Osamu Tezuka, and his professional manga debut will be at age 20 with the feature "TV Boy" in the magazine "Omoshiroi Book." September 4, 1963 – Tokyo-based animation studio TCJ’s first anime series Sennin Buraku premieres late on a Wednesday night. Sennin Buraku is based on the Edo-period gag manga by Ko Kojima which has been continuously published since 1956. 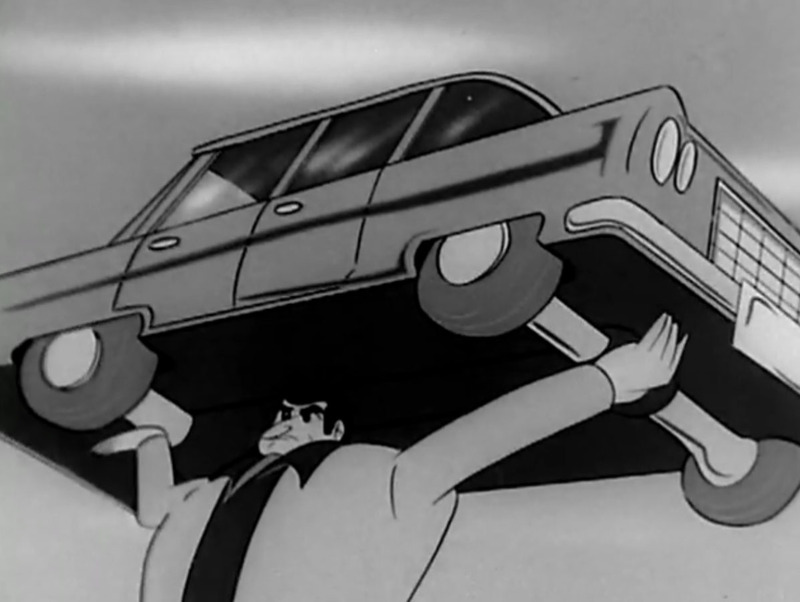 October 20, 1963 – TCJ’s animated Tetsujin-28 series airs on Fuji-TV. Based on the Shonen Magazine manga by Mitsuteru Yokoyama, Tetsujin-28 is the first giant robot anime and will later be localized as Gigantor and syndicated across America by Trans-Lux. November 1964- Hideoki Inoue illustrates Space Patrol Hopper manga for Bokura Magazine. 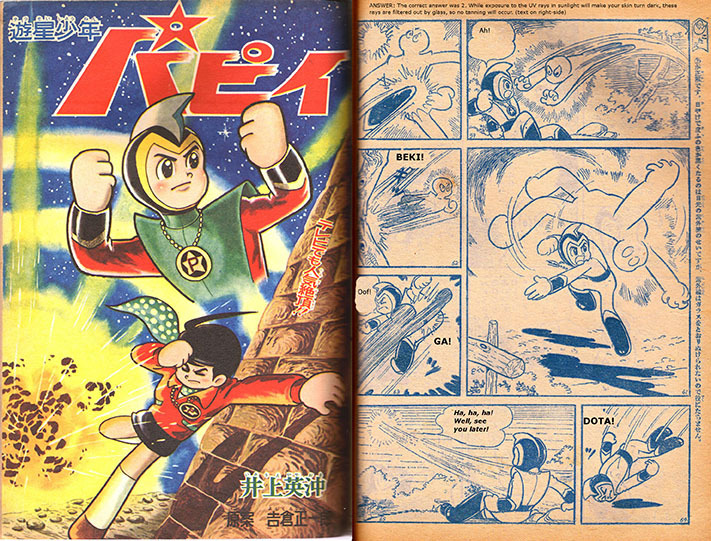 Space Patrol Hopper will be a Toei Animation TV series from February to November, 1965. 1965- "Yoshikura Shouichirou" – a pseudonym for Higake Takeichi, Okura Sato, Yamamura Masao, Kano Ichiro, and Futaba Juzaburo – create Yusei Shonen Papi for TCJ, with financing by Japan's top ad agency Dentsu and data gathered from a survey of 10,000 Japanese boys and girls. Using a combination pen name as creator of an anime series will also be a hallmark of Toei ("Saburo Yatsude") and Nippon Sunrise ("Hajime Yatate") productions. 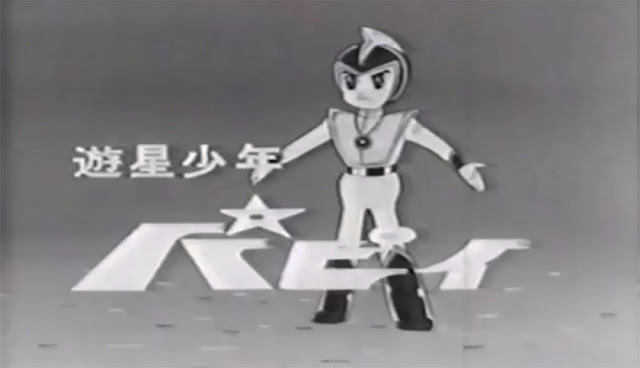 Yusei Shonen Papi manga will first appear in Kobunsha's Shonen in November 1964, drawn by Hideoki Inoue, and the TCJ-produced animation will premiere in June of 1965. Sponsor Glico will market a full line of Yusei Shonen Papi tie-in candy and merchandise. June 3, 1965- after a galactic council chooses to help the people of Earth, the advanced civilization of the hidden tenth planet Clifton sends a young member of the Galactic Peace Force named Papi to Earth to defend peace and justice. A genius with an IQ of over 300, Papi is able to utilize the mysterious Metalyzer, a pendant powered by a generator on Clifton that allows Papi to change the molecular structure of any object, as well as fly, perform feats of strength, survive underwater and in outer space, emit destructive rays, and do anything else the script requires. Every 168 hours (one Earth week) new energy is sent from Clifton to power the Metalyzer. En route to Earth, Papi's ship is struck by asteroids, and aware of the danger, Papi requests that HQ on Clifton erase part of his memory so he won't be tempted to return and abandon his mission. 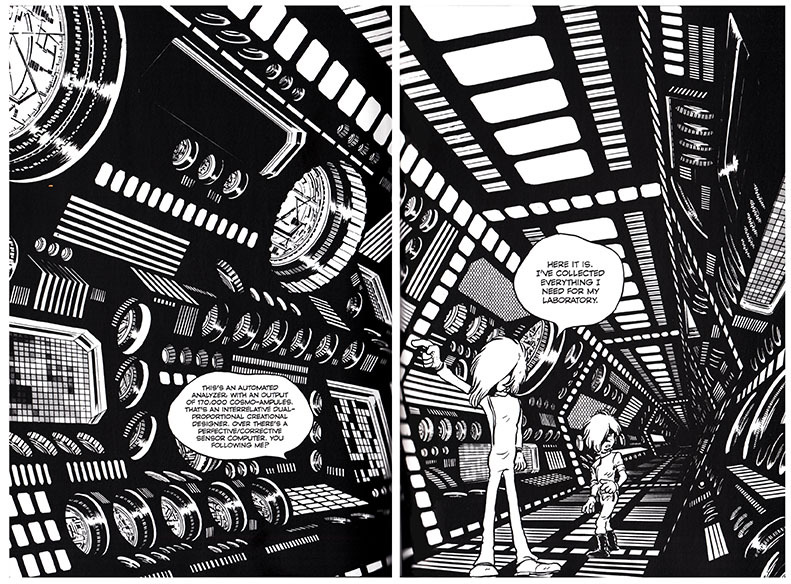 The damage to his ship results in a crash on Earth and Papi's memory is almost totally erased. Landing on Riko-chan's family farm, he remembers enough of the Metalizer to chase oil-speculating gangsters away. Soon Papi is joined by new friends Strong the wrestler and Ajababa the Arabian wizard. He'll spend the next 52 episodes battling crime and robots, armies and monsters, flying saucers and space demons. After a year on Earth Papi is recalled to Clifton, and must say farewell to all his friends on Earth. Yusei Shonen Papi will be broadcast on Japanese television and released on VHS and DVD in Japan. 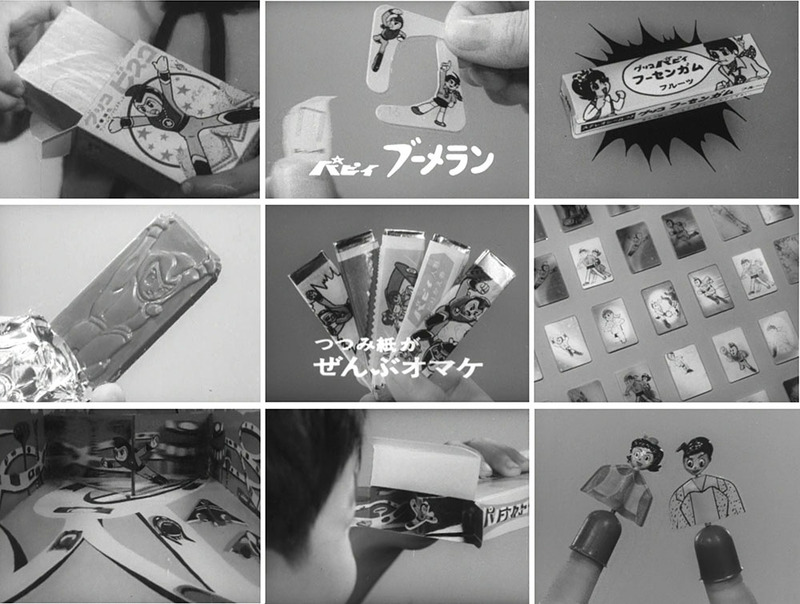 June 3, 1965– Yusei Shonen Papi premieres on Fuji TV at 7pm, and will air 52 episodes until May 27, 1966. It will be replaced in its Thursday time slot by the live-action Kokusaihoei adventure series Phantom Agents, created by Tatsuo Yoshida, while Papi moved to 7pm Fridays. When Papi ends, its replacement will be TCJ animated series Yusei Kamen ("Asteroid Mask"). Both Yusei Shonen Papi and Phantom Agents will be packaged for overseas license by Kazuhiko Fujita and his K. Fujita Associates. 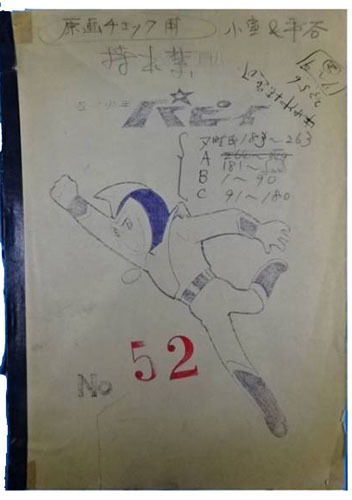 K. Fujita will be instrumental in the early days of Japanese TV animation for his work securing financing from advertising agencies for Japanese animation (as he did with Dentsu and Yusei Shonen Papi), as well as licensing Japanese cartoons for export. K. Fujita’s other series include Gigantor, Eighth Man, Marine Boy, Speed Racer, and films like Terror Beneath The Sea. 1966- Copri International Films, a Miami-based dubbing house partially owned by a former Havana casino manager with ties to mob boss Meyer Lansky, hires Florida actress Catherine "Bobbie" Byers to voice the character of Prince Planet. Other cast members include Kurt Nagel as Aja Baba and future "Santa Claus" actor Jeff Gillen as Pop Worthy. English-language scripts for Prince Planet will be written by Reuben "Ruby" Guberman, erstwhile screenwriter for Florida trash-film king K. Gordon Murray. Copri also dubbed TCJ series Eighth Man, and did Spanish-language work for many clients including the CIA. 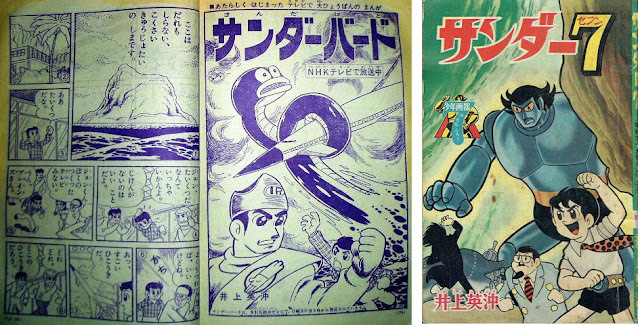 1964-1966- Yusei Shonen Papi manga by Hideoki Inoue is published in Kobunsha's weekly Shonen magazine, along with Mitsuteru Yokoyama’s Tetsujin-28, Osamu Tezuka’s Tetsuwan Atomu, Hisashi Sekiya's Stop! Nii-chan, and Fujio Akatsuka’s Leave It To Chiyota. 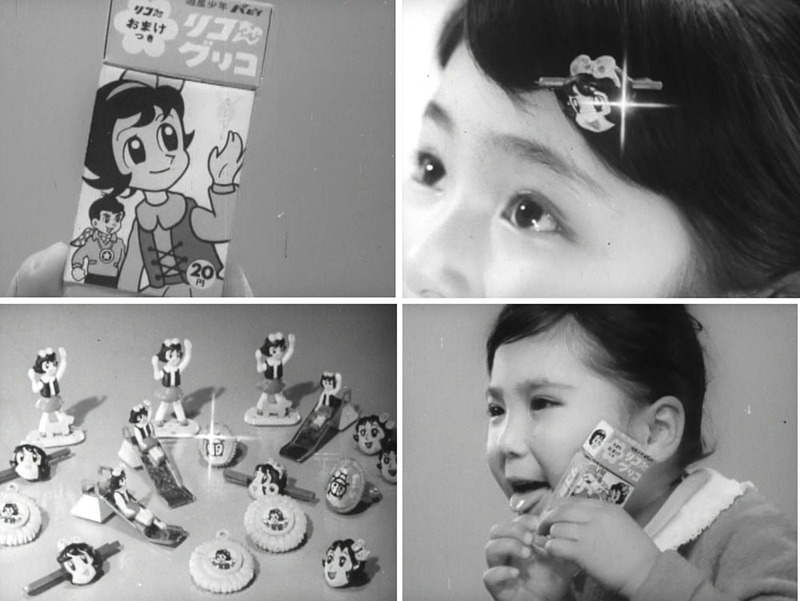 1965-66 – children across Japan enjoy both Yusei Shonen Papi on TV and the many Glico candies and candy premiums produced in conjunction with the series. Papi is featured on Papi gum, Papi chocolate, Papi stamps, Papi yo-yos, Papi whistles, Papi biscuits, Papi lenticular moving pictures, Papi finger puppets, Papi boomerangs, Papi bubble gum, Papi parachutes, Papi balancing toys, and what may be the most complex cartoon-character candy premium ever, the Papi Panoramascope. Riko gets her own line of candy and toys marketed at girls, with Riko hair charms and Riko pendants and a replica of Riko's ladybug ring. Glico even produced replicas of Papi's Metalyzer and a Papi costume sized for children. American kids got none of this, and we still feel kind of cheated. Glico's chocolate pretzel snack Pocky will, however, make great inroads into the North American snack food market. December 23 1965– the Master Of Misery, Krag of Kragmire (aka Golem) makes his entrance in episode 30 of Yusei Shonen Papi, and will menace Prince Planet throughout the remainder of the series with his bat wings, his funeral director's demeanor, and his saw-blade pocket watch. February 18 1966– Riko finds a pair of gloves that she believes renders her immune to harm, forcing Papi to spend the rest of the episode protecting her from the harm she knowingly exposes herself to (episode 38, "The Magic Gloves"). 1966- the Planet Radion sends young Universal Peace Corps member Prince Planet to Earth to defend decency and justice. Using his Pendant of Power, Prince Planet can change the molecular structure of objects, fire powerful rays, and is given flight and super strength. Crash landing on the ranch of "Pop" Worthy, he is befriended by Worthy's daughter Diana. Soon he meets out-of-work studio wrestler Dan Dynamo, Ajababa the wizard from Abadon, and occasional supporting character Kevin Kirby, who is both a hydro-electric power station engineer and Diana’s uncle. Together they face crime and robots, gangsters and space aliens, invading armies and destructive plants. After a year on Earth, Prince Planet leaves his new friends and returns to Radion. 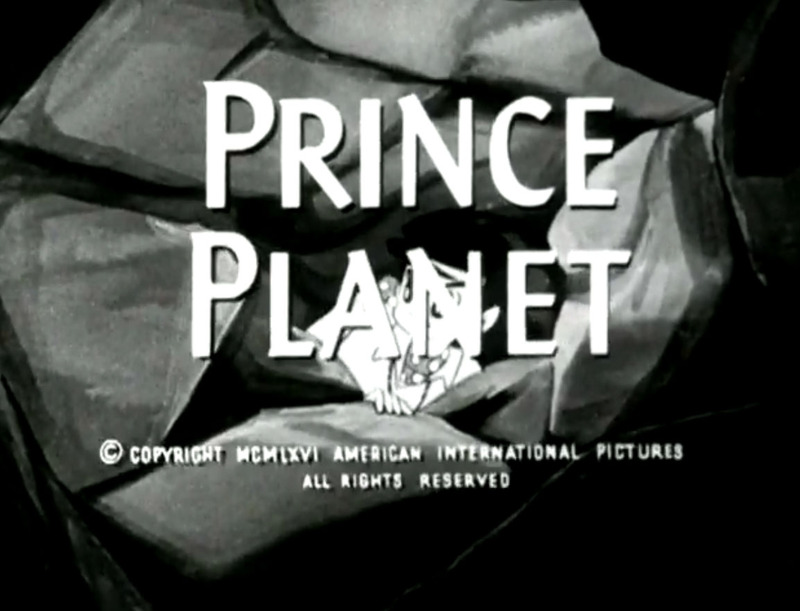 From 1966 until the mid 1970s, Prince Planet will be seen on American syndicated UHF television and will also become a popular series in Australia. 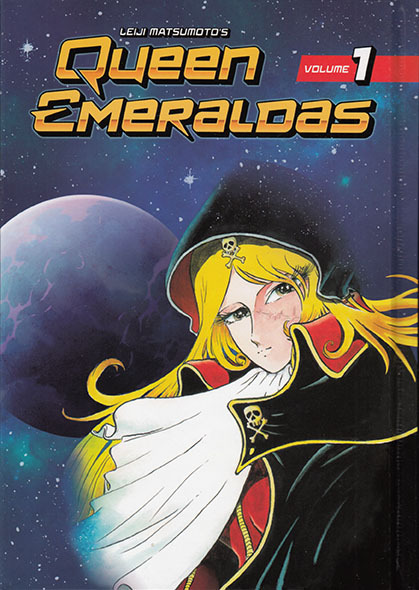 The series is never released on licensed home video in North America. MGM will make the Prince Planet series available on streaming video and digital TV in the 2000s. 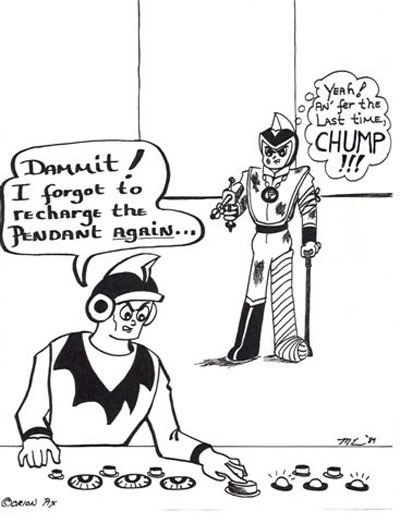 1965-66– the Galactic Peace Force chooses perhaps the laziest, most forgetful officer on Clifton to be responsible for ensuring Papi’s Metalyzer is fully charged. Rest assured whenever Papi’s in trouble and needs a fresh burst of Metalyzer recharging, this doofus will be asleep at the literal switch. 1966– the Carol Lombard Singers perform the theme song to Prince Planet. Carol Lombard worked with legends like Frank Sinatra, Sam Cooke, and Elvis Presley, and her singing group also did the theme to Flipper and many AIP musicals produced by Prince Planet musical director Al Simms. 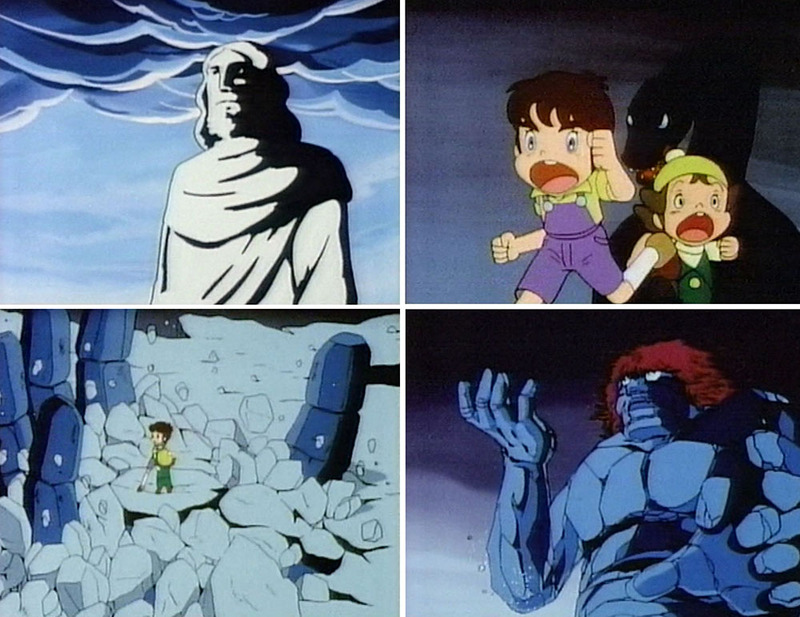 May 27 1966- Golem (Krag) is finally defeated in battle with Yusei Shonen Papi, and Papi returns to his home planet, leaving behind all his Earth friends, in the final episode of Prince Planet, "Distant Home Planet." 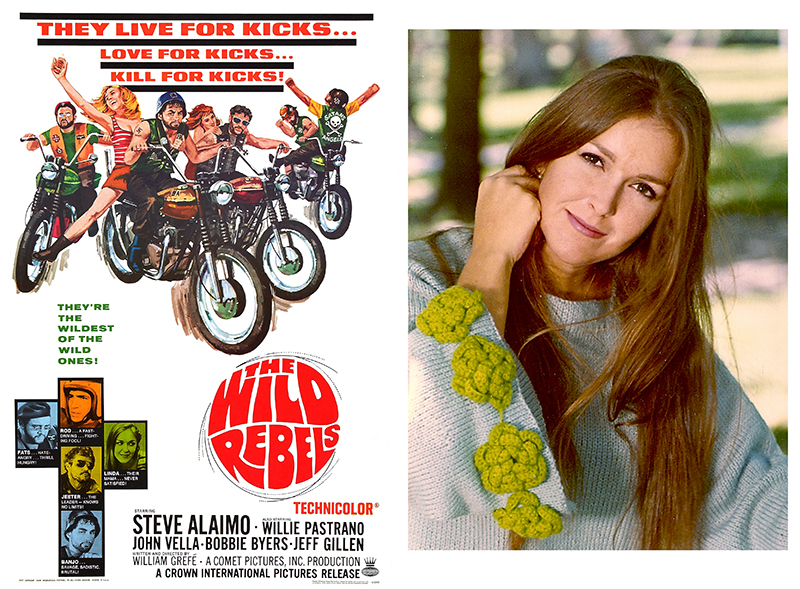 1967- Prince Planet voice actor Bobbie Byers stars as Linda, "too much woman for any one man", in the 1967 Crown International biker film Wild Rebels, directed by Florida auteur filmmaker William "Death Curse Of Tartu" Grefe, who would later direct William Shatner in Impulse. 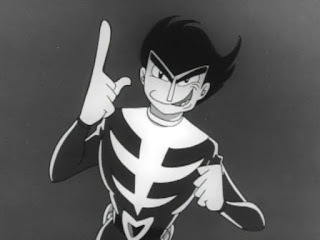 1968– Manga artist Hideoki Inoue spends his Yusei Shonen Papi profits on high living and entertainment, and is soon broke and in trouble for nonpayment of taxes. 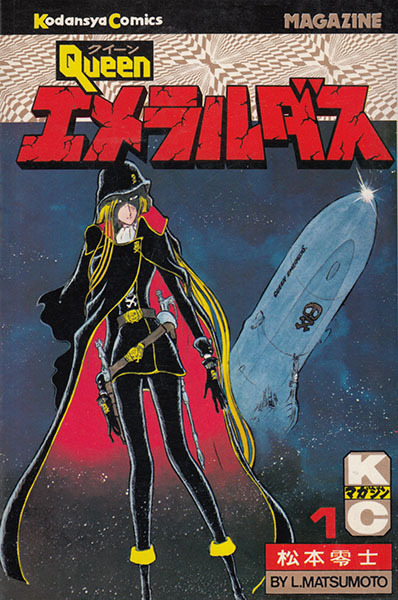 His post-Papi work includes licensed character manga based on Ultraman, Ultra Seven, Ultra Q, and Thunderbirds, as well as non-licensed manga series Thunder Seven, Crazy Planet, and Dogma 3. 1968– Prince Planet voice actor Bobbie Byers stars in the motorcycle gang movie Savages From Hell (aka "Big Enough 'n Old Enough"), also starring Sidney Poitier's brother Cyril. The film is directed by Joseph P. Mawra, who also directed "Chained Girls" and "Shanty Tramp", the latter screenwritten by Prince Planet writer Ruben Guberman. 1973- Future Let’s Anime blogger Dave Merrill watches Prince Planet for the first time on Chicago's WSNS Channel 44. The program is hosted by ventriloquist Steve Hart and sponsored by KAYO Chocolate Drink. The memories of Prince Planet will spark a lifelong interest in Japanese animation for Merrill and many others. 1977– the first national Japanese fan group, the Cartoon Fantasy Organization or C/FO, begins in Los Angeles California. Eventually it will have chapters in most major American cities, including Atlanta. 1985– future Let’s Anime writer Dave Merrill helps found a C/FO chapter in Atlanta GA and assists in hosting regular screenings of old and new Japanese animation in libraries, community centers, comic book and SF conventions, and anywhere else with a TV and a VCR. August 1986- Yusei Shonen Papi manga artist Hideoki Inoue passes away in his apartment in Japan. He had avoided payment of income tax on his Yusei Shonen Papi profits, which by now had all been squandered. Estranged from his wife and family, Inoue died alone. 1986- Membership in the C/FO facilitates contact with anime fans across the country, some of whom have Prince Planet episodes and are willing to trade. Tape trading with C/FO members allows many, including this author, to see Prince Planet again for the first time in 13 years. 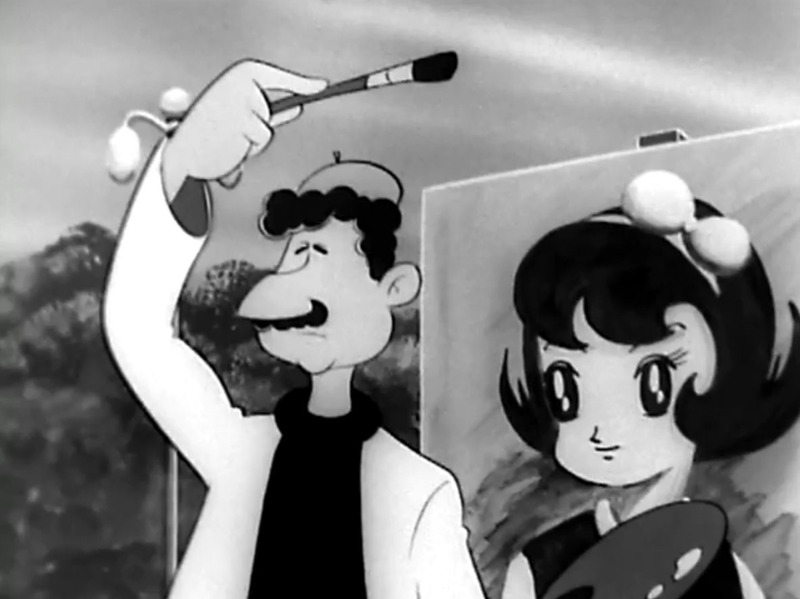 1988- The national C/FO self-destructs, the local anime club becomes a chore, and future Let’s Anime blogger Dave Merrill decides to concentrate on his core interests, the Japanese cartoons of the 1960s. 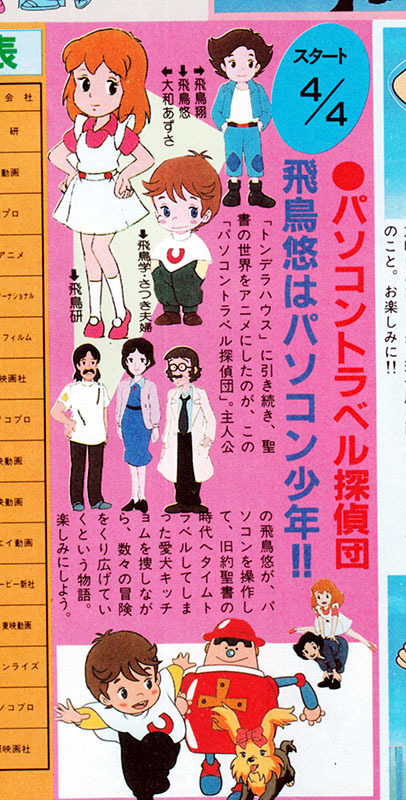 He will start an organization called the Prince Planet Foundation, in an attempt to gather together 60s anime fans. 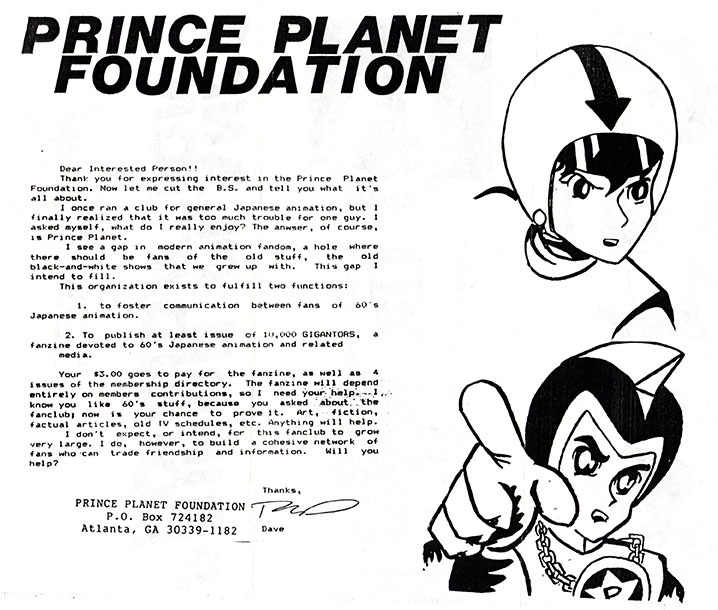 The Prince Planet Foundation will publish a newsletter, “Ten Thousand Gigantors”, featuring articles and fan artwork and fiction, and will connect fans of classic anime across America. 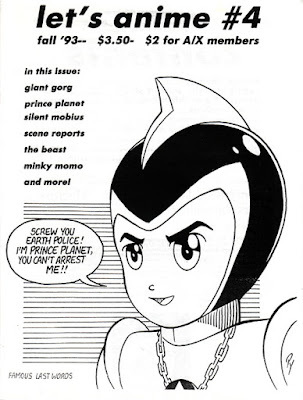 1993- the print version of Let’s Anime publishes an extensive article about Prince Planet. 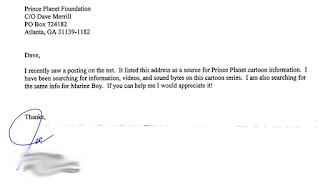 1995- The new digital technology of “the internet” results in Prince Planet Foundation founder David Merrill receiving plaintive emails from total strangers, asking if there was any way they could ever see this cartoon they grew up with. 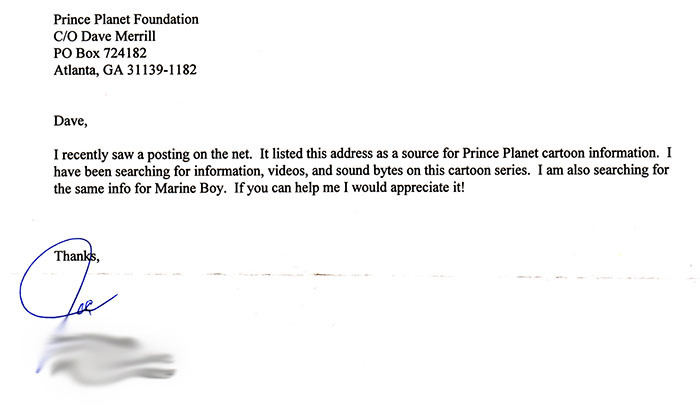 Merrill spends the next few years copying Prince Planet episodes for total strangers. 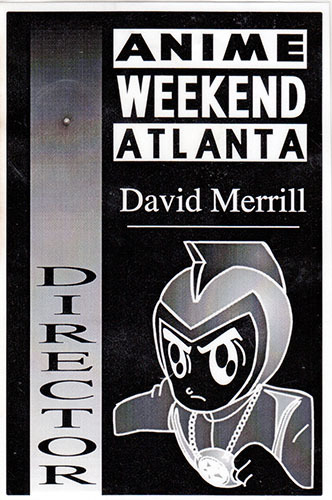 October 1995 - The Japanese animation festival Anime Weekend Atlanta holds its first annual convention, and the badges for staff and attendees feature YSP/Prince Planet artwork designed by convention graphics specialist CB Smith. 1999- Enough is enough, says Prince Planet Foundation organizer Dave Merrill. He stops responding to queries about Prince Planet episodes. 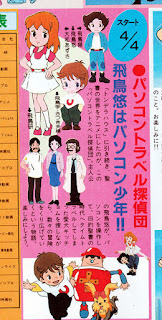 July 2007 - Classic anime blog Let’s Anime begins online publication. November 2009 – MGM announces more than 45 episodes of Prince Planet will be made available on streaming video sites Hulu and YouTube. The 47 episodes available on YouTube will eventually vanish, but the Hulu access will remain for years. November 2009 - Let's Anime readers participate in a Prince Planet art contest to celebrate the release of Prince Planet on Hulu and YouTube. The blog receives a lot of great artwork and everybody gets a T-shirt, courtesy MGM. 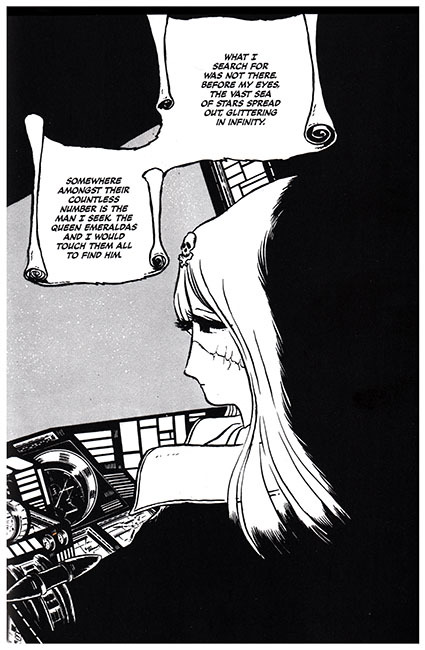 January 16 2012 – Let’s Anime posts the first of a 3-part English translation of Yusei Shonen Papi manga, partially scanned directly from a crumbling 1965 issue of Shonen Magazine. February 18, 2012 – Manga Shop Series 445 is released, the first volume of collected Yusei Shonen Papi manga. This 288 page black and white digest-sized book collects the first half of the YSP manga as it appeared in Shonen Magazine, as well as reproductions of illustrations from the Asasi Sonorama Papi storybook single. Manga Shop Series 446 completes their YSP reprint. 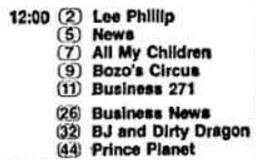 April 2014 - digital broadcast TV network The Works, a channel owned by MGM Television, begins airing Prince Planet as part of its schedule. May 2014 - TGG Direct, Inc announces the release of Prince Planet on DVD in North America, and the DVD set is listed on Amazon. May comes and goes with no release, and the listing is removed from Amazon. Queries to TGG go unanswered. November 2016 - Classic anime blog Let's Anime celebrates fifty years of Prince Planet with a celebratory blog post filled with information on both Yusei Shonen Papi and Prince Planet, which you are now reading. Will there be more excitement ahead for YSP/Prince Planet fans? 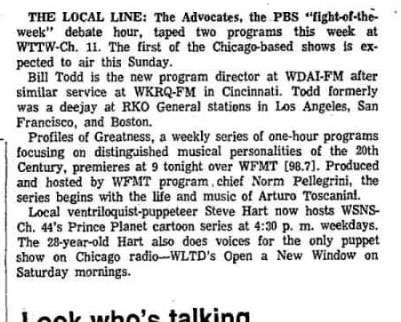 Will Prince Planet return from Radion, or MGM’s vaults, to battle for truth and justice again? Only time will tell! thanks to Meg Evans, James Sternberg, the people of Radion, MGM, Rick Zerrano, AIP-TV, and "Yoshikura Shouichirou" for their YSP/Prince Planet assistance.